How big is the gender pay gap in UK engineering? The gender pay gap in UK engineering has been mapped by The Engineer’s 2017 Salary Survey – women engineers earn on average £10k less per year than male colleagues. The survey – which is now in its third year – is based on responses from 2,743 UK engineers working across a range of different sectors. Seven per cent of these respondents are female. This compares to 6.5 per cent in 2016, and 5.5 per cent in 2015. These figures are broadly in line with other measures of industry’s gender demographic. 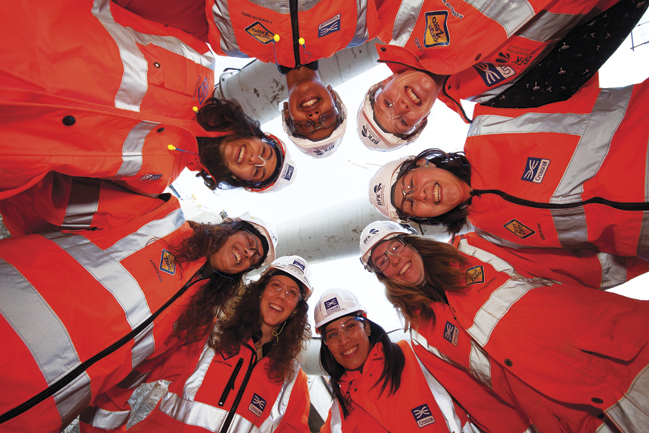 According to the latest figures from WES (Women’s Engineering Society), just 9 per cent of the engineering workforce is female and only 6 per cent of registered engineers and technicians are women. Although the figure represents a slight increase on the average salary among women in 2016, of £36,201, the overall gap in salaries between men and women remains unchanged, and it seems that female engineers have benefitted less from an industry-wide average salary increase of 6.6 per cent over the past 12 months. As in previous years, the best-performing sectors in terms of gender diversity are academia and the rail, civil and structural sectors, where just over 10 per cent of respondents are female. The biggest gender gap was found in the automotive sector, where women accounted for just 2.8 per cent of the sample. Salaries for UK engineers have increased by 6.6 per cent on average over the last 12 months (The average salary now stands at £48k). There should be legal requirements to explain these pay gaps rather than just stating they exist. What if they exist for the same reason they traditionally exist in other fields? Because of life choices and such that women make that differ from those men make. If there is a genuine gap in pay that is not brought on by life choices then it should be dealt with, however if the gaps only exist because of life choices then correcting for them may show that the gap is much smaller than it appears. 2) The raw data from the survey. 3) Acknowledgement of potential errors in the survey. 4) Indication on how the sampling was conducted. 5) As far as I can tell, any kind of peer review. A link to the original survey is provided in the story. I can’t find a link to the original survey, only the report that was generated from it. Would be good if you could show me the link though so we can look at what data was collected and not reported on. It seems to me that unless the gender pay gap is within the same company, it is difficult to see a way to address it. Across the industry as a whole the gap is meaningless. A measure of pay versus service may also be of benefit, since a history which includes significant time off for parenthood etc is otherwise ignored. Please re-analyse the data taking into account age as well as gender. So you need to look at the gender gap for the different decades (less than 30, 30 to 40 etc.). I believe that 40 years ago the whole of society (men and women) had a gender bias, in favour of men, but we have to live with this, we can’t suddenly promote 60 year old female engineers who underperformed all their career, to be managing director, with no experience a few years before they retire. I believe the gender bias problem has been fixed and is swinging the other way. There is now a small bias in favour of women, but articles like yours run the risk of increasing the Female gender bias for the younger generation . If I’m correct, this will show in the age + gender analysis for the under 30 group. I have two daughters at university (no sons), so it doesn’t bother me too much if there is a female bias. However teenage boys don’t have the vigour and tenacity that we used to have. It is as if they are being blamed for hundreds of years of male dominance, causing them to underperform. I find such articles frustrating. Engineering is a career that people almost never move into later in life. The gender ratio of 55 year-old engineers is founded on the ratio in universities and apprenticeships around 35 years ago. On my course there were about 7% women. With life choices, applicable across many walks of life, that is likely to reduce a little over time. More recently, the proportion of women on engineering degrees is far higher – courses from 20-50% and beyond I hear anecdotally. So an overall ratio of 9% might be good or it might not. And average pay for a group of engineers biased to early stages of a career is likely to be less that for engineers as a whole. More important would be data on the % women in engineering apprenticeships, studying maths+physiscs a-level, in degree courses, and taking engineering jobs after completing apprenticeships/degrees. That shows us the strength of our foundations for the future, and shows the success (or not) of activities with 12-17 year olds in particular. But there are vital points potentially lost amongst the unusable figures. The sentence “…women at every level of seniority are on average paid less than their male colleagues” warrants investigation. Is that underpayment or early promotion or individuals over/under-stating their seniority or something else? Come on TheEngineer (and the institutions) – get some decent analysis so we can be confident we are not seeing fake news headlines. Do these studies control for industries out of interest? Some industries tend to attract more men than women and vice versa and they may pay differently (eg off shore oil – more men- better pay- skews averages due to less women entering this industry). As the story makes clear, the headline figure is a mean average across all sectors. As the story also reports, the gender salary gap does vary from sector to sector. We assume your comment on some industries attracting more women than men isn’t directed at the engineering or manufacturing sectors where – as this story also reports – there is a pronounced gender gap across the board.